Safe, efficient transportation depends on infrastructure that supports multiple ways of traveling from point A to point B. Not just by road, but by air, water, rail, bus, bicycle and on foot. Locally, there’s a forward-looking, multimodal project that the MIC has been a partner in developing for many years. Public taxpayer investments, more than ever before, are being called upon to serve multiple goals. 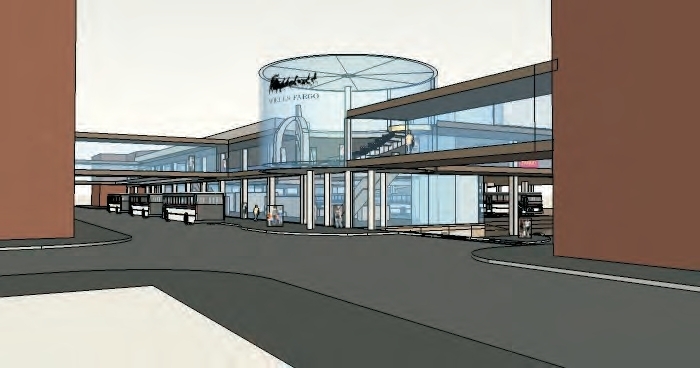 The proposed Duluth Multimodal Transportation Center does just this. It will provide a centrally located transportation hub that serves the City, the northeast region, and the state. The state of the art facility will serve passengers of the Duluth Transit Authority’s local bus service as well as passengers of inter-city bus services. Both Jefferson Lines and Indianhead Transit as well as local providers LCS (private) and Arrowhead Transit (public) will be using the facility. It will add parking for commuters and provide space for rental cars and taxi operations, as well as secure bike parking. 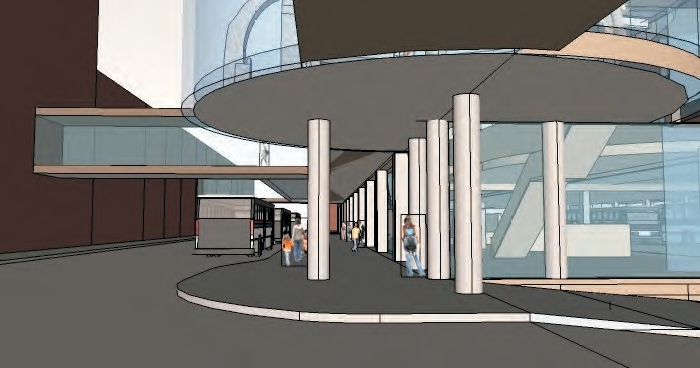 Pedestrian and bicyclists will be connected to the downtown area, convention center, and waterfront trails via replaced skywalks and concourses. The transit area will take advantage of all the DTA’s state-of-the-art technology and provide riders with real-time information and other amenities in a safe and secure area. It’s being developed in response to documented needs. 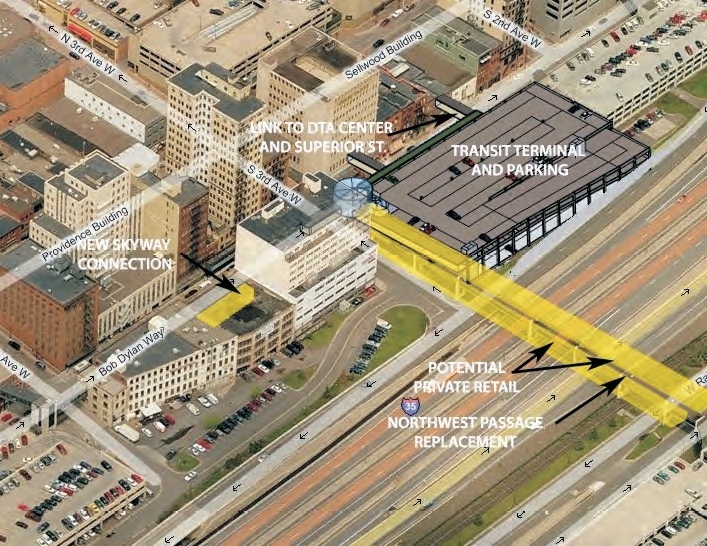 The existing DTA transit center on Superior Street requires improvements to increase safety and security, to improve the effectiveness of the current and future transportation demand, and to provide connectivity to the overall transportation system. The project includes upgrading portions of the aged Northwest Passage Skywalk with an improved design, easier connections, and potential retail commercial potential. Working with non-profit, private owners, community partners, current and future tenants of the facility will strengthen the value of the facility. The DTA will work with a private partner on this project and will use the design/build concept of construction to rapidly complete the project. This project is being put forward as part of Minnesota’s proposed 2012 bonding bill, to appropriate $6,000,000 to create jobs and invest in the multimodal transportation needs of tomorrow. Interconnected, multimodal transportation options encourage economic growth, reduce congestion and environmental impacts, and improve mobility and access to transportation for both people and goods. For these reasons, there’s lots of support for this project at the local and federal levels. Let’s make sure we support our state lawmakers to see this bonding bill through and see these benefits happen here in Duluth. Political gridlock in Washington has resulted in years of legislative limbo in dealing with our nation’s aging infrastructure. But something needs to happen by March 31, when the eighth (!) extension of the SAFETEA-LU federal surface transportation bill expires. In a possible sign of progress, both the House and Senate have pledged to take action on the reauthorization process, which sets the laws, priorities and spending levels for federally-funded transportation projects and programs for the next several years. And indeed there has been a lot of Congressional activity this past month and even this past week. But reaching agreement on what exactly will be included in the new transportation bill—and how to pay for it—is a convoluted process. Enacting a bill by the end of March will require that both the House and the Senate negotiate no fewer than ten procedural hurdles and more significantly, overcome deep political and philosophical differences. And from what we’ve seen just this week, there are plenty of differences to reconcile. From our perspective, the proposed legislation contains some good news in that it is favorable to existing MPOs such as the MIC so that we can continue our work to plan, prioritize and coordinate federally-funded transportation projects with local input. Of concern to us, however, is that funding for the Safe Routes to School program is eliminated, along with the Transportation Enhancements (TE) program and “complete streets” projects that make infrastructure improvements for bikers and pedestrians in addition to cars. Then, also troubling, the House Ways and Means Committee weighed in with a proposal to eliminate gas tax funding for bus transit and other mass transportation systems. Transit, Air Quality Improvement, Congestion Mitigation and other programs would be placed into a renamed Alternative Transportation Account and would need to be funded annually through the general fund and annual appropriations process. Non-auto oriented transportation programs, however, do have a measure of bipartisan support, which up until recently has been how our country has made its important transportation infrastructure investments. Several House Republicans, led by Rep. Tom Petri (R-Wis.) with backing from Democrats, attempted to amend the draft bill to restore funding for bike and pedestrian projects and Safe Routes to School. And the Senate has so far managed to reach bipartisan agreement on their version of the bill. A two-year, $109 billion reauthorization, called Moving Ahead for Progress in the 21st Century or MAP-21, passed the Environment and Public Works Committee last month. The transit component of that bill was released by the Senate Banking Committee with unanimous bipartisan support for public transportation programs at current funding levels and includes some reforms — such as allowing federal funds to be spent on operations — that transit advocates have been pushing for. You may have heard by now that the House’s bill, in addition to cutting some transportation programs to pay for the reauthorization, proposes a new source of revenue in the form of royalties from new oil and gas drilling leases on public lands and federal waters. This, however, is a contentious issue and may or may not make it into the final bill during the step when the House and Senate reconcile their two versions into a final bill. It also extends the federal gas tax at the 1993 level of 18.3 cents-per-gallon (as well as the 24.4 cents-per-gallon diesel tax and the .001 cents-per-gallon leaking underground storage tank tax) for the next five years. Much of the pressure to pay for the problem of the nation’s aging bridges, highways, and transit systems will fall to the states. Most—like Minnesota and Wisconsin—are refocusing their priorities on preserving and maintaining the existing system rather than constructing new roads. Although states may consider raising their portion of the gas tax, or automatically increasing the existing rate for inflation, finding new ways to fund transportation will require innovation, new technologies, and smarter management practices to ensure their scarce resources address the key problem areas. MnDOT is conducting studies on new user-fee mechanisms that assess fees based on how many miles you drive on the roads rather than how much gas you put in your tank. Other states are considering expanded use of tolling and state infrastructure banks. And many of these new options may be downright unpopular. As we noted previously, it’s not just our politicians who will need to make some attitude adjustments. No matter how long it takes for Congress to hammer out a new transportation bill, and despite the cuts it will make or efficiencies it will impose, all of us, as beneficiaries of the transportation network, will need to be willing to make a shift in how we think about paying our way. We at the MIC are transportation planners. We lay the groundwork for projects that use federal tax dollars. Large, public, tax-funded infrastructure requires a huge investment of federal, state and local funds—but then, our region’s mobility, quality of life, economic growth and competitiveness rely on the transportation network. Every household and business depends on safe, multi-modal transportation infrastructure for moving people and goods. Our job is to coordinate with all local jurisdictions so the money for this infrastructure is well-spent and reflects local priorities. We at the MIC are also elected officials. Our Board members represent all local units of government in the Duluth-Superior area—states, counties, cities and townships. Because these neighboring jurisdictions all have responsibilities and make decisions that impact the transportation system, coordination is key to making efficient use of limited financial resources. And the term “stakeholder” is the real deal for us – figuring out and working with those who have a vested interest in the decisions that get made. Our job is to work with the right people – planners, engineers, local officials – to set joint priorities for funding projects, agree on timelines, and to share information about the projects we’re up to. This kind of cooperative process is what Metropolitan Planning Organizations (MPOs) like the MIC are designed to do, here and across the country. We facilitate a bottom-up approach to transportation planning, allowing for local input into decisions how federal funds are spent, instead of a top-down approach that would make decisions about local projects and priorities at the federal or state level. Our Harbor Technical Advisory Committee, or HTAC, is recognized as a national model for doing just that—getting the right people in the room to solve problems. The HTAC is a nationally-recognized, bi-state forum to discuss issues confronting the Ports of Duluth and Superior. The HTAC brings together a broad range of industry, environmental and government stakeholders to provide sound planning and management recommendations and to promote the harbor’s economic and environmental importance to our community. HTAC stakeholders have worked for many years to craft the Erie Pier Management Plan, a blueprint for transitioning the Erie Pier Confined Disposal Facility (CDF) to a first-of-its kind Processing and Reuse Facility (PRF). By creating a cost effective and environmentally sound alternative to current dredge material disposal practices for Great Lakes ports, this innovative Plan will save local taxpayers the millions of dollars it would have cost to develop a new CDF. The Landside Port Access Study was used to educate the public and policy makers about the land-based access needs of the Port and laid the foundation for funding a new roadway project (Helberg Drive) to improve access and safety. The MIC’s Corridor Planning initiatives seek to be proactive, by identifying and addressing problems along local roadways before they arise. They balance mobility needs with adjoining land uses and environmental and community interests. Our North 28th Street Plan identified and made recommendations to alleviate critical transportation issues on North 28th Street, in Superior, in advance of planned road reconstruction. Significant safety concerns needed to be addressed due to several conflicting land uses, including the construction of three new schools, a skate park, a recreational trail, housing units and a newly-developed commercial area. The Duluth Heights Traffic Circulation Study was undertaken at the request of neighbors and local elected officials to address the issue of residential streets being used as an unwelcome and unintended thoroughfare to a commercial district. Using an extensive public participation process, MIC staff worked closely with residents to document the level of cut-through traffic, and identify options to reduce impacts and improve flow in and around the neighborhood. This planning process set the groundwork for the City to pursue funding for a new roadway connection (Joshua Avenue) between the Miller Hill commercial district and the east side of Duluth. The MIC’s Long Range Planning initiatives provide policy guidance, goals and coordinated strategies for jurisdictions within the greater metropolitan area of Duluth, MN and Superior, WI. Directions 2035 is our Long Range Transportation Plan, setting forth a vision for the area-wide transportation network for the next 25 years. The LRTP provides a framework for working cooperatively to provide a well-maintained, integrated, accessible and multi-modal transportation system to safely and efficiently move people and freight, within the constraints of funding the region can reasonably expect to receive. The Duluth Urban Area Growth Impact Study examines how best to accommodate growth in areas outside the urban services boundary while ensuring taxpayer protection from the consequences of inefficient patterns of development. Future land use information from each jurisdiction was used as part of a regional planning process to examine growth impacts and to identify the specific areas best suited for development. The MIC’s planning initiatives for modes of travel that are not centered on cars and trucks account annually for about 20% of our work program and budget. They are important because they aim to improve access, mobility and quality of life for all people in our area, regardless of age or physical ability, whether they travel by car, bike, bus or on foot. The MIC’s Bicycle and Pedestrian Advisory Committee (BPAC) engages local stakeholders to provide sound planning recommendations and to provide public outreach and education about bike- and pedestrian-related plans and projects. The Duluth-Superior Area Bike Map is our most popular product, an award-winning guide to the best on- and off-street bike routes in and through this region. 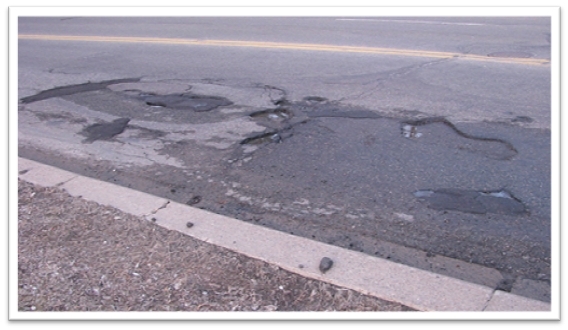 The Duluth Sidewalk Study provides technical and policy guidance to assist local elected officials in working with neighborhoods during roadway reconstruction projects. The GIS-based interactive map is a powerful tool for decision makers to apply data to the sometimes-contentious discussions about locating sidewalks on local streets. Safe Routes to School (SRTS) Plans: The MIC was an early proponent of SRTS planning, working closely with many community stakeholders collecting data, conducting field observations and identifying safety issues around schools. The MIC’s recommendations have been incorporated into many funded projects to improve bike and pedestrian access to schools in the cities of Duluth, Superior and Proctor. Transit Planning: The MIC provides ongoing input and technical assistance on local transit initiatives including planning and securing funding for a future downtown multimodal facility. Results from a recent ridership survey will be utilized by MnDOT to determine the potential for utilizing transit service to mitigate the effects of major construction projects statewide. Hopefully this gives you an idea of how we have worked (for nearly forty years!) to ensure that federally-funded infrastructure investments are developed with input from the people who know this area best. As a local resident, do our planning initiatives reflect your priorities? As I discussed in an earlier post, there’s a growing local and national backlog of critical transportation infrastructure projects—with no funding in sight. You might be interested to know that all branches of the federal government, from both sides of the isle, agree that we are not investing properly now for the transportation needs of the future. To put this in perspective, the U.S. is spending approximately 4 to 5 times less on infrastructure than other countries are, including developing nations like China and India. Since our interstate highway system was built in the 1960s, government expenditures on infrastructure have fallen to just 2.4 percent of GDP. In contrast Europe invests 5 percent of its GDP on infrastructure and China 9 percent. As a result, the United States Is now ranked twenty-third overall for infrastructure quality, between Spain and Chile. Not so long ago, spending tax dollars on infrastructure was not nearly so political and divisive as it is today. Roads, bridges and railways used to be neutral ground on which the parties could come together to support the country’s growth. In 1991, the federal transportation bill (the Intermodal Surface Transportation Efficiency Act, termed ISTEA for short), passed both branches of Congress by nearly a 5 to 1 margin. Today’s gridlock in Washington has resulted in years of legislative limbo. Transportation funding has been limping along under a series of short-term extensions and appropriations because Congress can’t agree on what should be included in the new transportation bill—and hasn’t figured out how to pay for them either. The consequences of this inaction are severe. 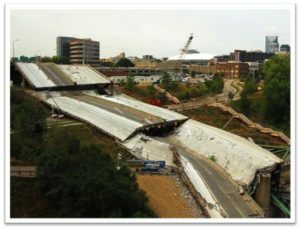 Crumbling bridges and roadways and increased congestion will not only be expensive problems to solve in the future, but will also have a cost in the increased amount of time we spend on substandard roads. Our nation’s economic future relies on its ability to deliver goods and services, a task that is increasingly more difficult as our highway system falls into disrepair. Without action, our nation’s economic competitiveness will diminish. While the urgency of the problem is plain to all – the political will to fix it isn’t there. And the hard part is, it’s not just our politicians who will need to make some attitude adjustments. All of us, as users of the transportation network, will need to be willing to make a shift in how we think about paying our way. There are many options, ideas and technologies available to us to pay for the transportation system we need, now and into the future. But they will take some getting used to. I’ll talk about them in my next blog post. Stay tuned. An updated transit plan for the Arrowhead Region has just been released for public review. It’s a plan that’s aimed to coordinate resources and cover more ground with less. 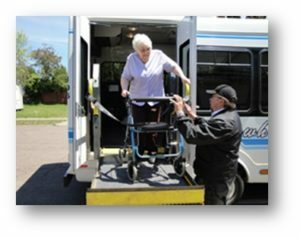 The 2011 Local Human Service Transit Coordination Plan for the Arrowhead Region outlines broad strategies as well as specific project ideas to help the transportation-challenged – elderly, disabled, and low-income – get to medical appointments, services and jobs. The strategies and project ideas identified in the plan will be used to set priorities and support competitive bidding for certain Federal Transit Administration (FTA) funds that are dedicated to assisting these groups. 3) Federal and state transit assistance is facing significant cuts. And that’s where the value of this transit plan comes in – to leverage existing resources (vehicles, drivers, etc. ), to provide services more efficiently throughout the region with those limited resources. Many of the strategies identified in the coordinated transit plan call for projects that create more resource-sharing opportunities, or create “one-stop-shop” call centers that can assist with organizing and lining up ride opportunities. Perhaps the most important project idea in the plan, however, is to convene a regional coordination body, bringing together the region’s service providers every year to continue to find ways to work together to overcome challenges. And that’s a big move forward! Can you think of another way to take on the daunting challenge to get everybody on board? This plan is open for public comment until 11/10/11. For those of you interested, the plan can be reviewed on ARDC’s Regional Planning website.